Tears of Chios. Napoleon in Love. It all sounds terribly dramatic, doesn't it? Actually, what I have been up to recently (apart from being too overwhelmed by new eateries to write about any of them), is to try out a recipe that uses up a) a few more pieces of the mastic gum that has been sitting at the back of my fridge, b) all the egg yolks I had left over from trying to imitate Domain & Ayr's 20-minute souffle pancake, and c) a jar of rose petal jam that was forgotten about for far too long. The "tears of Chios" part refers to droplets of mastic gum, a plant resin produced from the mastic tree. The Ancient Greeks used it as chewing gum as well as to flavour wines, and during the Ottoman rule of Chios (a Greek island famous for its mastic production), it was apparently worth its weight in gold. A box of mastic (in large tears) from Chios. The resin can be difficult to work with. Once you get it on a stainless steel pot, it is nearly impossible to remove, a bit like the sticky polymerised mess you get if you've baked oil into a jelly in the oven. And like Blu-Tack, it softens when warmed up, so you can imagine the challenge you are faced with when your recipe tells you to grind the stuff. Diane Kochilas recommends grinding mastic with a pinch of salt or sugar, but what I found much easier was to freeze the resin pieces until they are hard, then put them in a plastic bag and bash them with a rolling pin. Tip 1: Keep mastic away from your pots and pans, at least in its soft and sticky form. Tip 2: Rather than grinding the resin with a mortar and pestle, freeze and smash it into powder. In terms of flavour, I found mastic to be a potent taste of pine resin: fresh and green, yet also very dominating. You only need a tiny bit to realise it is there! Most recipes I found use it in desserts, though apparently the Egyptians use it for savoury dishes as well. It must be a pretty common ingredient in that part of the world, because there is even a recipe for almond and mastic gum cake from Nestle Egypt. The recipe I tried out was for making "napoleons in love". I had no idea what this was supposed to be at first, but I came to realise that "napoleon" is another term for what I knew as mille-feuille, and the love part comes from the use of pistachios and rose, as well as the shape of the final pastries. Assembled "napoleons in love", only a quarter of the recipe here, if that. Making these sweet treats is relatively easy, but there are quite a few steps involved. You can make both the mastic-flavoured custard filling and the pistachio praline ahead of time, then on the day you want to serve these, bake the flaky pastry and assemble everything. I thought it was quite misleading that the recipe states it makes 4 napoleons though. I had enough filling and topping to pair with 4 sheets of frozen puff pastry. Perhaps these hearts were supposed to be much bigger than I had cookie cutters for? I did have a bit of drama in the kitchen, though nothing too disastrous. I decided to be lazy and skip the steps of straining the pastry cream and cooling it in an ice bath. Only when I realised the custard was starting to separate did I whisk everything back together and cool it quickly. Tip 3: Follow the steps in the recipe. Straining the custard will give you a smoother texture, and cooling it in an ice bath will help it set and not separate. The custard was not as smooth as it could have been. When making the pistachio praline, I had trouble getting the sugar to dissolve in the tiny amount of water specified. Oh well, I thought, the granules will probably disappear once I heat everything up. I can help it along by stirring it. I was wrong. The bubbling syrup still had sugar crystals in it. Take a look at what I ended up with, instead of a golden-coloured syrup! I was left with sugar granules after the water evaporated. Fortunately, all was not lost. I added more water to the pot, this time properly dissolving the sugar, then gently heated it again, without stirring, until it caramelised to a rich brown. I then poured this over my toasted pistachios. Tip 4: To make molten sugar candy, make sure the sugar is completely dissolved in the water, and do not stir while heating, to avoid crystalisation. Perhaps I should have let the molten candy cool ever so slightly first, because some of it flowed away from the nuts before hardening. The next day, I discovered what had become a brittle solid had now absorbed moisture from the air, and was getting soft and sticky again. My solution this time was to dry the pistachio praline in the oven, chop it up as soon as it cooled, and store it in an airtight container. Tip 5: Make sure you store your praline in an airtight container, to stop it getting soft and sticky. Baking the pastry shells sounded like the easiest part of the recipe. Unfortunately, even using store-bought puff pastry, I had a dose of fail, because the baking sheet I placed on top was too light to stop my shapes from puffing up too much, sometimes unevenly. Heart-shaped pastries: before and after baking, then brushed with rose jam and sprinkled with praline. Tip 6: If you don't want your puff pastry to rise too much while baking, place a baking sheet over the top, and weigh it down with a roasting pan or similar. Finally, it was time to assemble all the parts. Heating the rose petal jam made it runnier and easier to remove the flower petals, but I don't think I should have added water to it, because the praline did not stick very well to the pastry using such a thin "glue". 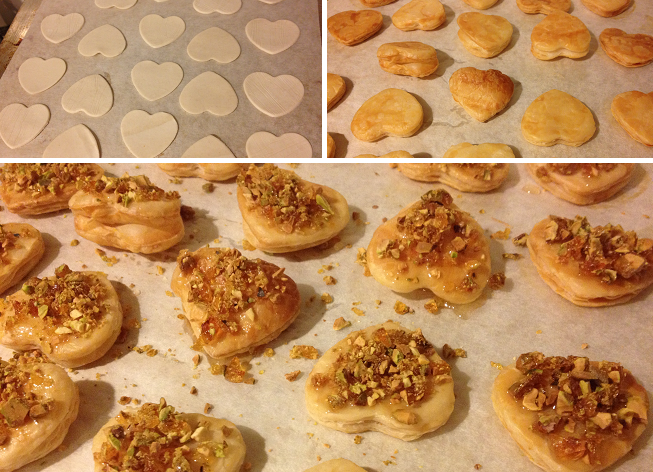 Apart from the heart shapes, I tried putting whole sheets of puff pastry together. While this was more efficient time-wise, I did have trouble cutting the dessert into pieces without squeezing out the custard filling or flattening the pieces in the middle. The squares in the middle got a bit squashed. And the verdict? Not everyone will like the taste of mastic (the pine fragrance can be reminiscent of cleaning fluids) or rose (which in large quantities can make it feel like you are eating pot-pourri), but if you don't have an aversion to these ingredients, you will fall for "napoleons in love". This dessert has a balanced mingling of flavours, and a variety of textures, from the crunchy/chewy praline to the flaky pastry to the soft custard. Try it and see for yourself! This post is part of Our Growing Edge, a monthly blogging event aimed at inspiring us to try new things. This month it is hosted by Marija from Palachinka. What an experiment! I had no idea how Mastic was difficult to work with. Wow what a great looking end product! Looks like a lot of effort went into this and how funny that you had most of the ingredients just sitting around. Also, I wanted to thank you for commenting on my blog last week and reminding me that I should post again. I had forgotten how much I loved doing that until I actually sat down at the computer! Whoops, forgot to reply to this. Thanks, yes, I just had to make these pastries once I realised I had all the ingredients there. Great to see you blogging again. Really enjoy reading your writing!